For some time now, I’ve been annoyed by how skill books work. At first I used Sometimes Pick Up Books to avoid taking unnecessary books, then I started using Turn Off Skill Books[/url]… but the idea is interesting and brings some variety to the game. The problem is that any character can improve all his skills with skill books, and for this he does not necessarily have anything to be able to do in this skill. Your dovahkiin may not know any spells (okay, with mods that remove starting spells), but read the book and improve conjuration skill. He can not create a single potion, but to learn some knowledge from the literature written by the alchemists for alchemists. Can learn fighting techniques without ever holding a sword, and so on. When, for example, a warrior reads a book about conjuration, his level will increase, but he will not become stronger (and your enemies up along with your level). With disabled autoleveling, it’s just an easy way to get a level. I made this mod so that I could finally not worry about accidentally picking up an unnecessary book. So what’s he doing? The mod adds checking to the skill level when reading the book. If the skill level is insufficient, the player will not receive a bonus to the skill level. But you can try later, when you get a basic knowledge of this skill. When you read the book, having a sufficient level of skill, you get as before an +1 to the skill level. The skill level threshold raises questions and I would like to hear your opinion about it. For reference, in a vanilla game, the minimum skill level is 15. Depending on your race (and race mods) the player gets +5 and +10 to some skills. That is, the maximum starting level of the skill is 25. I set the skill treshold to 27, which gives a small gap considering fast levelling at low levels. if you, for example, play as an Orc, then to obtain magical knowledge from the books, you will need to train longer than Altmer, which is logical. I also included in the installer options for starting values 0 or 1 (i.e. maximum = 10) and for 5 (maximum = 15), which you can get with mods. It makes no sense for vanilla values. I also made speechcraft not require a skill level, as it is a universal skill for any character. Any mods that add new skill books will not be affected (need a patch). 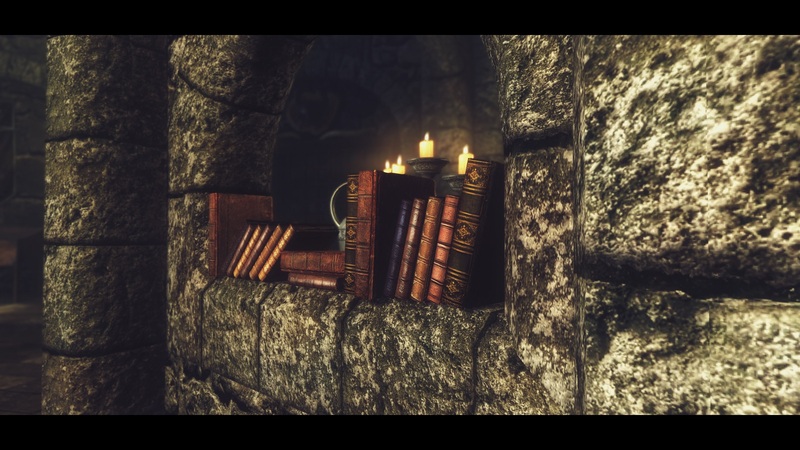 This mod will conflict with many mods that change books, but note that this mod is created as an alternative to many other mods that change how skill books work, not an addition to them. Sometimes Pick Up Books and Unread Books Glow﻿ must be compatible. moreHUD will not display the skill of book, as in fact this mod does not modify the vanilla system, and replaces it with a new one. Other mods that add their skill to book titles are incompatible. Requiem is probably incompatible, but with Requiem you don’t need this mod so much. The installer contains an option to replace all lockpicking skill bonuses with a pickpocket. For SkyRe/Perkus Maximus/other mods where these two skill trees are merged. Compatibility for Book Covers may be added in the future. For now, you can place my mod after it (you’ll get vanilla textures for skill books, but otherwise my mod won’t work). Paper texture replacers, etc. will be compatible until they have esp plugin (in this case, it is need checking). It is recommended to install this on a new game, otherwise you can get a bonus from already read before installing the mod skill books. This mod requires all DLC and USLEEP. Install with your mod manager. Mod Organizer is cool.